Discover the life-changing spiritual world of Thich Nhat Hanh’s Plum Village in this poetic and inspired graphic memoir. This one-of-a-kind graphic novel is at once a touching memoir, a reflection on the beauty of life in all its most surprising and awe-inspiring aspects, and a tribute to Plum Village, the meditation center founded by world-famous spiritual master Thich Nhat Hanh in the South of France. 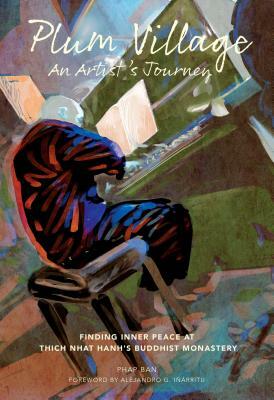 Through his inspired storytelling and graceful paintings, author Phap Ban tells the story of his journey in pursuit of happiness and self-acceptance, from successful Disney artist and writer to monk at the Plum Village international community of spiritual seekers and peace activists. Visually striking and deeply poetic, each page of Plum Village: An Artist's Journey is a beautiful guide to the teachings of Thich Nhat Hanh and a testimony to his profound spiritual legacy as seen through the eyes of a devoted disciple. Born in Genoa in 1960, Phap Ban started to publish comic books for Furia, Intrepido, and other magazines during high school. He worked as a freelance illustrator during university, and then, at twenty-four, he discovered meditation. This ultimately led him to Vietnamese Zen master Thich Nhat Hanh and the monastery he founded in France, Plum Village. Ban lived in Plum Village for ten years, first as a layman, then as a monk. He received complete ordination in 2010. When he returned to Italy in 2013, he resumed his creative work, this time as an artist for Disney. He has also taught courses at the Academy of Fine Arts in Genoa and at the Lecce School of Cartoon.